As the world creeps closer and closer to irreversible climate change and governments seem increasingly unable to cooperate on reducing greenhouse gas emissions, some scientists have proposed the removal of carbon dioxide directly from the air using carbon capture technology. And with carbon concentrations rising by 2 ppm every year, such geoengineering solutions seem like a viable last ditch effort to save the world from climate catastrophe. At least, until you look at the cost figures for implementing such technology – which is exactly what Kurt Zenz House and a team of MIT researchers did in a study recently published in the Proceedings of the National Academy of Sciences. According to the MIT research team, such large-scale implementation of carbon capture would be far too costly and impractical to implement on a global scale. 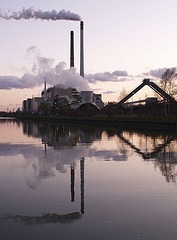 Costs to remove CO2 from the atmosphere using carbon capture technology would cost around $1,000 per tonne of CO2, compared to $50 – $100 per ton for current power plant scrubbers. The team thus concluded that it would be far more effective to remove CO2 right from its source (at the power plant), rather than try to extract it from ambient air in the atmosphere. Part of the reason why the costs skyrocket is because CO2 concentrations in ambient air are far lower than concentrations emitted from a power plant. Rather than try to capture carbon from the atmosphere, which would cost $33 trillion just to hold CO2 concentrations steady, it would be for more practical and cost-effective to just implement scrubbers and CCS right at the source of the pollution – and in the meantime, install renewable energy sources. Furthermore, capturing carbon from the atmosphere would require about four times more energy than would be generated by burning fossil fuels in the first place. And if the technology relies on energy input from fossil fuels sources to begin with, it could result in a net increase in CO2 concentrations. Although the study highlighted the impracticality of extracting CO2 from the atmosphere, it did propose some interesting alternatives. For instance, a more cost effective solution would be to plant trees to extract CO2 from the atmosphere, and then burn the trees later for electricity while scrubbing CO2 at the same time. While such a strategy would still cost a few hundred dollars per ton of carbon, these costs may be more viable in the future. But in the end, the most practical climate change strategy would be to aggressively decarbonize our energy system entirely through the use of renewable energy like solar, wind, or geothermal. Renewable technology is getting more and more cost-effective every year, with some estimates suggesting it has nearly achieved cost-parity with fossil fuels.